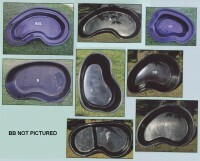 Preformed Fiberglass Ponds provide the least amount of work in shaping your pond. Simply excavate enough Earth for the Preform to fit, backfill with the excavated dirt, and you're done! Should you decide to go with Fiberglass, there is a huge selection of volumes and depths from which to choose, including plenty of shapes--everything from geometrically giant rectangles to unanimously unique amoebas! 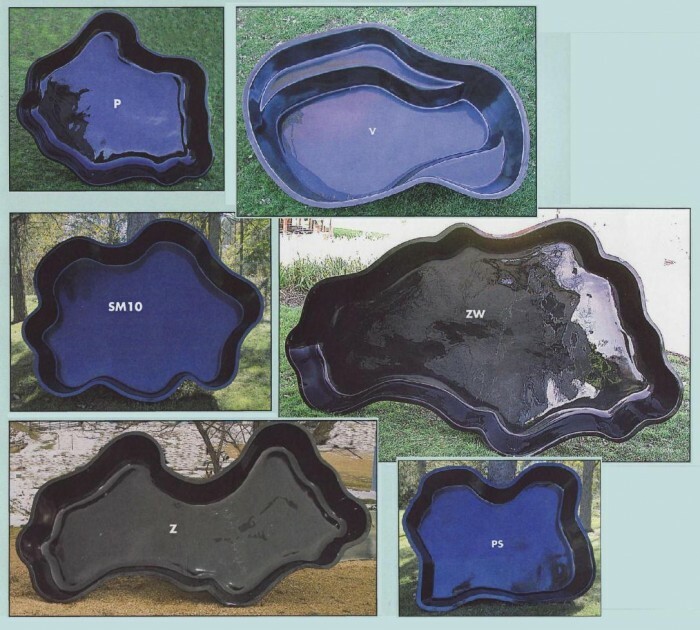 Important Note: These ponds incur additional shipping costs as they are too large for UPS Ground shipping which our site quotes. If you place an order we will use your address information to get an exact shipping cost for you. We will then contact you with this information so you can decide weather you would like to continue with the order. 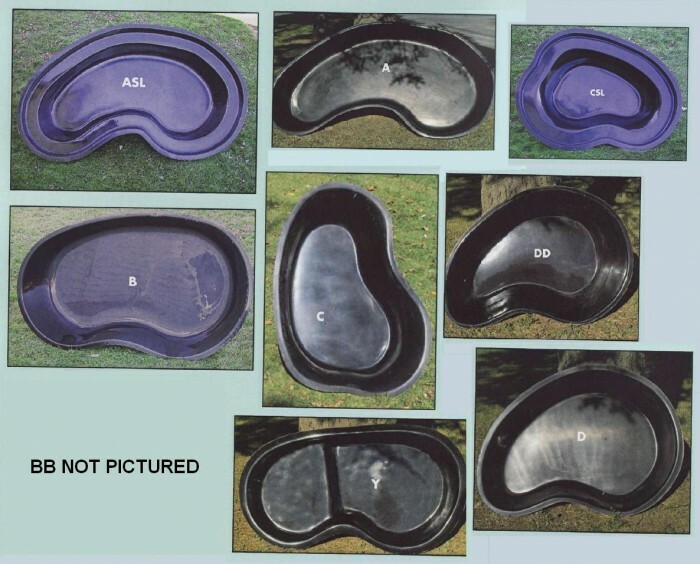 These are small to medium sized Circular Fiberglass Preformed Ponds, ideal for small water features, and very small ponds. Only the F3 and GG4.5 models are deep enough to safely weather over fish in the Winter. Uniquely available in both full-size, and half-size (shown in picture), these Large Circular Fiberglass Preforms have a much greater water capacity, and both the half and full-size options are deep enough to keep fish safe over the winter. 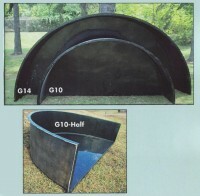 ***Half-sizes are great for installation along the straight side of a structure or a landscape design! 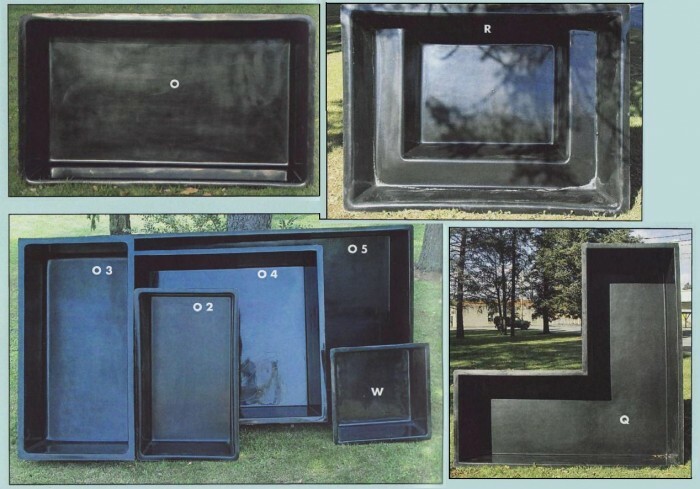 For straight-edged, sharp-cornered ponds, check out our Rectangular Fiberglass Preforms. With the exception of the O, R, and W Models, all pools shown are capable of weathering fish over the Winter. 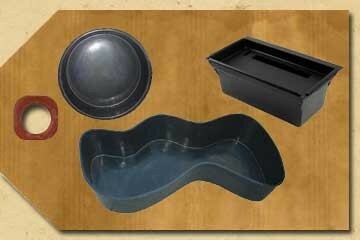 The R Model also has an integrated shelf with an 8-inch depth, perfect for bog and marginal plants. The demensions for the "L-Shaped" Q Model apply to each of its rectangular sections. Undulating and amrophous are just two ways to attempt to describe these Amoeba-Shaped Fiberglass Preforms. Once set in the ground, there is nothing revealing of an unnatural pond. The shapeless, or "free-form" designs take the guessing work out of creating an original waterscape shape, and the result is almost nothing short of a true pond! 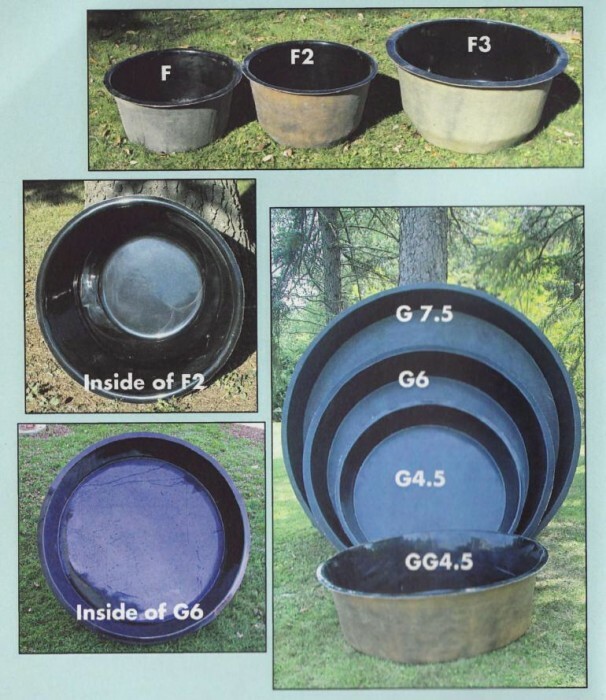 Of all these Amoeba-Shaped Fiberglass Preforms, only the T Model is deep enough for fish Winterizing, complete with an 18-inch depth and a 6-inch shelf at opposite ends. The U and S Models also have 6-inch shelved sections. 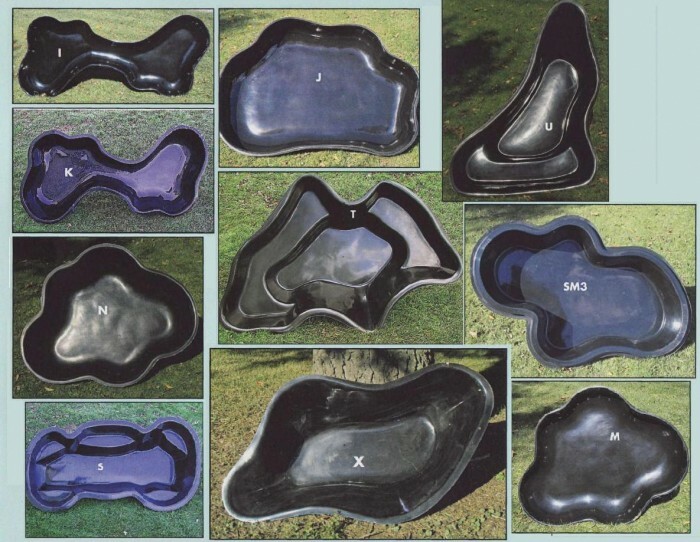 Do you like the look of those Amoeba-Shaped Preforms, but want something bigger for more fish, more plants, or a Winter-safe pond? 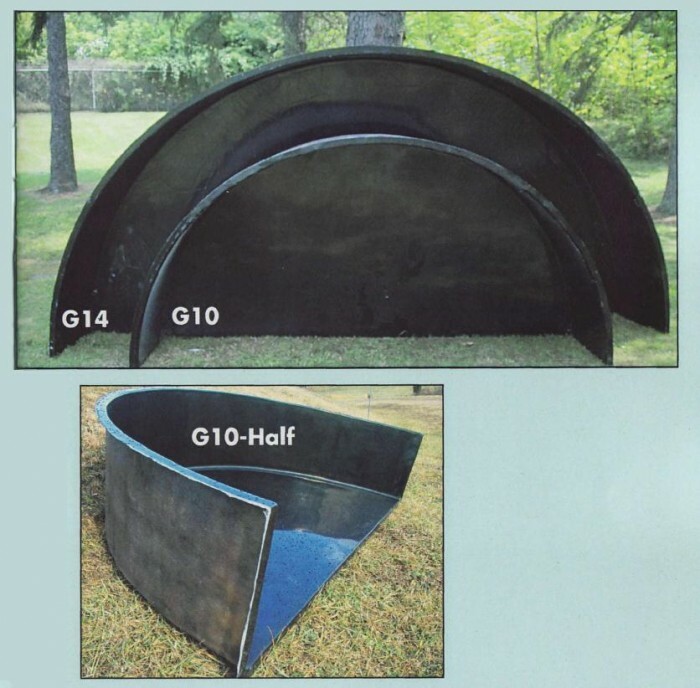 How about a Large Amoeba-Shaped Fiberglass Preform! Just like their counterpart, smaller series of Preforms, these Fiberglass Ponds have uniquely designed shapes comparable to any natural pond. Take away the need for water feature construction labor with these Spillway Integrated Fiberglass Preforms. 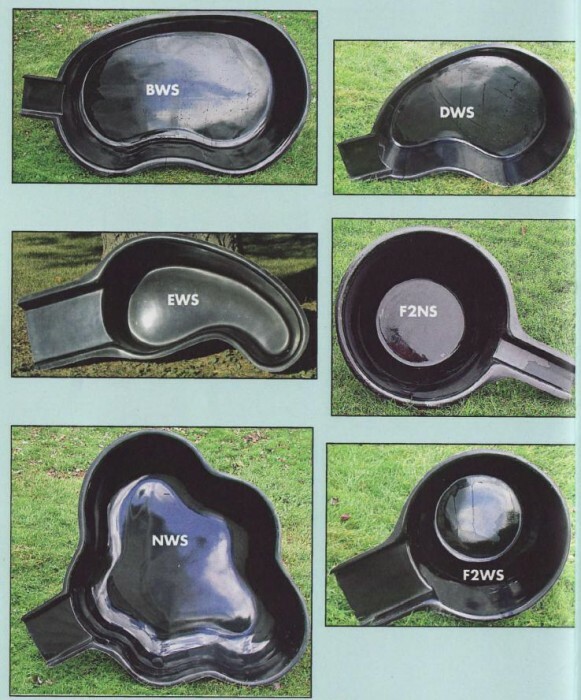 Although these Preforms are not capable of Winterization, fish population, or massive waterfalls, they are great for small water features and turtle ponds, or to just add soft aquatic, ambient melodies to your backyard! 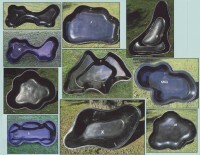 Need the BIGGEST Fiberglass Preformed Pond on the market?? Look no further than the Giant LAKE KOI FIberglass Pond. This massive 2150 gallon pond will house plenty of huge Koi for years and years!